Village Pilates offers personalized coaching in both fitness and rehabilitation in a supportive non-competitive atmosphere. Founded in 2009 by Nicola Conraths and Bridgit Frank, we specialize in both Pilates and the GYROTONIC® exercise method . Our focus is on individual private sessions. Our knowledgeable, caring, STOTT® trained instructors are passionate about helping you achieve your personal goals. We believe your time spent at Village Pilates should be a relaxing, invigorating, and an energizing experience. We are happy to communicate and work with your physician, chiropractor, or physical therapist in order to aid in rehabilitation of injuries or other health issues that you may have. 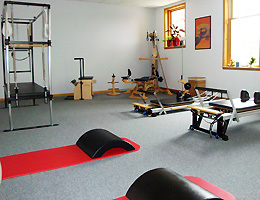 We offer Pilates duets (two participants) and Pilates Mix classes (three participants). Class sizes are limited in order insure that you receive the personal attention you deserve. Please feel free to contact us or call Bridgit at 231-929-2066 with any questions that you may have regarding Pilates, the GYROTONIC® method, our schedule, rates or mat classes. We look forward to working with you and sharing our passion for fitness and good health! I absolutely love this place! Thank you Bridgit, you make me feel strong and confident!